Down a shaded lane, away from the lively festivities of Smith Mountain Lake State Park and the Kings Point Pub, a sprawling ranch with gray shingles overlooks a serene cove. Small solar lamps light the curved stone pathway lined by planters brimming with seasonal color; a cheery garden flag welcomes guests. 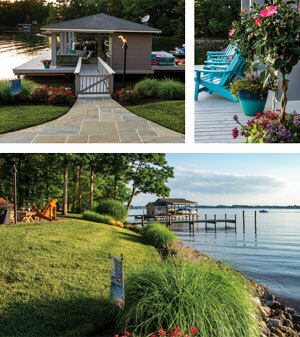 It’s a delightful picture and one that would make anyone fall in love with lakeside living. The Mabry home is a weekend retreat where the focus is firmly on outdoor fun and relaxation. 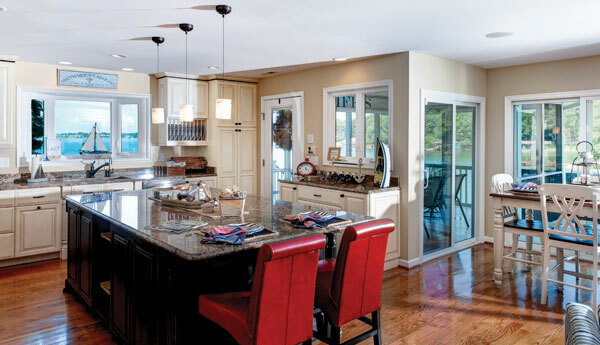 A large open-concept space offering a 180-degree view of the cove is the hub of family life indoors. Dressed in the classically nautical palette of red, white, and blue, chris and debbie’s thoughtful furnishings all point to relaxation in this lakeside locale. Chris and his girlfriend Debbie come to the lake every weekend. They entertain Debbie’s son along with Chris’ three grown daughters and four grandchildren: Mason, Jensen, Izzy, and Myles. Two of his children live in the local area and one lives in Charlotte, North Carolina. “I also have my managers up a couple of times a year,” he adds. With six bedrooms and five and a half baths, the house provides plenty of room for a growing family as well as friends and colleagues. Guests feel welcome here as soon as they walk through the door. A framed set of rules hangs over a cherry red console, inviting guests to “Wake up late, go on a hike, catch a fish, take a nap, catch fireflies, and wish on stars,” ultimately setting the tone for this casually elegant and traditional lake house. A few steps to the right, a large open-concept space offers a 180-degree view of the cove. Drenched in sunshine, this is the hub of family life indoors. Dressed in the classically nautical palette of red, white, and blue, Chris and Debbie’s thoughtful furnishings all point to relaxation in this lakeside locale. 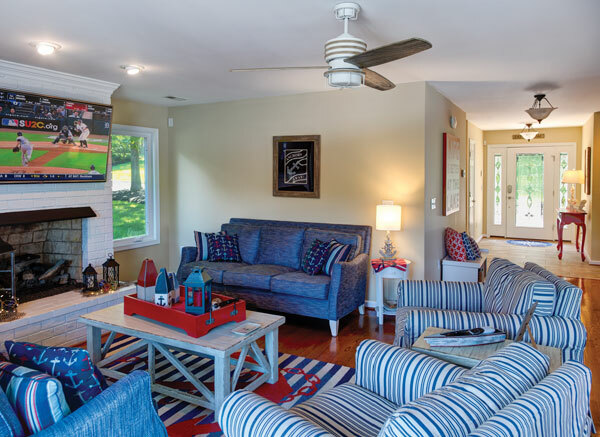 The den features a 55-inch flat screen TV anchored above a white brick gas log fireplace; striped easy chairs and sofas gather on a cabana-striped rug and provide seating for watching the game or cozying up by the fire. Throw pillows and wall decor add to the coastal motif, and several sliding doors take advantage of the stunning scenery as well as facilitate the ease of indooroutdoor living. An open-concept gourmet kitchen leads to a screened porch with adjacent deck, offering plenty of space for dining al fresco. While kitchen remodels are among the most popular home improvement projects, Chris left the gourmet kitchen as it was, praising the prior homeowner’s design and smart use of space. “This is the coolest spice rack ever!” Chris says with a smile on his face as he pulls open a narrow vertical spice drawer beside the stove. He moves over to the island: “This is fantastic—and it’s got storage all around it.” With a wine refrigerator and drawers galore, the five-by-nine island provides ample storage. It also serves as a gathering spot and even as an optional dining area, complete with a few red leather roll-top chairs. “We will eat here if it’s just a couple of us,” he says. The screened porch is accessed right from the kitchen. To improve the space, Chris replaced the old indoor-outdoor carpet with new tile, refinished the ceiling, and added air conditioners. 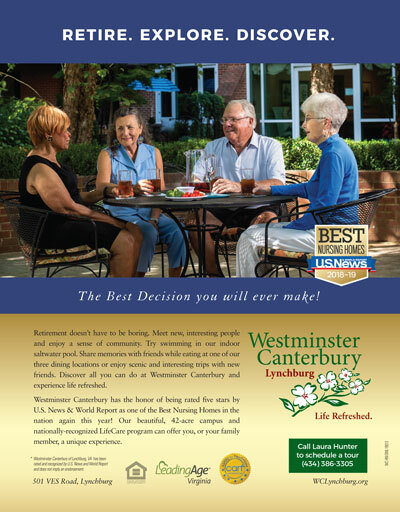 “We spend more time on the screened porch. It’s nice and comfy out here.” To the right of the porch is a deck with built-in seating; to the left, a bistro-like area with umbrellas over round tables for dining al fresco. Back inside, a hallway with built-in cabinets connects the family room to the sleeping quarters. While Debbie did most of the decorating (“She would love to own her own decorating company one day, and I think she could really do it!” Chris says enthusiastically), he outfitted the hallway himself. Chris shopped locally for SML-inspired finds, like a model ship, anchors, and oars from Cottage Gate. 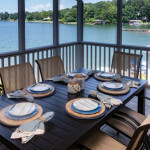 Framed family photos with happy lake memories rest above the cabinets that store towels, boat bags, sunscreen—everything you might need for enjoying the lake. Down the hall are several guest rooms and bathrooms. One is especially for Debbie’s son, complete with miniature sailboats and a white daybed fitted with navy and crimson plaid bedding. Another guest room is large enough to accommodate six overnight guests, with three queen-sized beds. The room’s furnishings nod to those of a lakeside cottage, with beds trimmed in bead board, charming life preservers, and paddles on the walls. “We use this room whenever we have company,” says Chris. The master suite is painted a serene aqua and affords brilliant lakefront views. The master suite at the end of the hallway affords brilliant lakefront views. You won’t find any window treatments here: “We just wanted to have that view,” Chris explains. He and Debbie painted the walls a pale shade of aqua to connect the inside and outside spaces. With a gas log fireplace and a few club chairs, this inviting space offers calm and respite. Although the property features two master suites (one on each level), Chris and Debbie chose the upstairs suite for its hisand- hers closet that provides ample storage space, a window, and even a custom builtin storage trunk. A room of comparable size, style, and comfort is just below on the lower level. Downstairs, the word “basement” seems like a misnomer: it is clean, bright, and fresh thanks to plenty of windows and new wood tile from T&K Tileworx in Lynchburg. Abundant light streams through several windows, lightening the downstairs master suite. 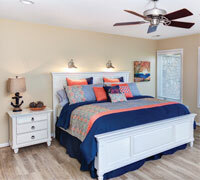 A fresh palette of coral and navy looks crisp against a white bed, and an en-suite bathroom provides privacy. A major renovation to this level included the creation of a new bedroom and bathroom, along with the installation of a new lower patio. Mabry explains: “This area was an old storage unit with concrete floors, so we put another bedroom in here, and it connects to a bathroom.” The bedroom provides walkout access to the new patio. 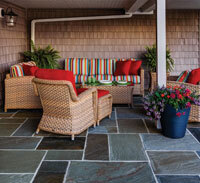 Originally just a storage area for lawn mowers and yard equipment, the patio now features a chat area with a loveseat, couch, two club chairs, and a little ottoman, adorned in colorful striped cushions from Tropicasual in Myrtle Beach. “All of our outdoor furniture came from Tropicasual,” he says. 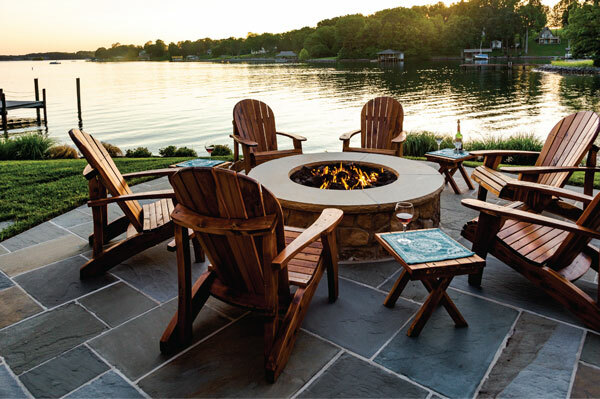 Beyond lies an extension of the patio with six cedar Adirondack chairs gathered around a fire pit. 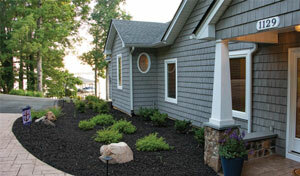 Overlooking the lake, it’s the kind of place Chris and his family can enjoy year round. 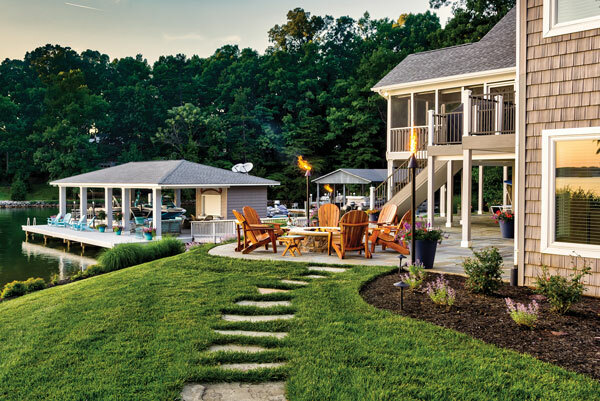 The home’s exterior features a fire pit and two docks. The main dock boasts a refrigerator, Wi-Fi, sound system, and 55-inch TV. Chris couldn’t be happier with his new lake home. “I like the house better, and I love the dock so much more. It’s huge! This is one of the biggest docks on the lake, and that was such a draw for me,” he explains. In fact, the property actually has two docks. “It’s a cool little feature of the land— somehow, some way, it wound up with two docks on it.” The dock that shelters the pontoon boat received necessary structural upgrades to the ceiling and support poles. Chris also added creature comforts like a refrigerator, Wi-Fi, a Sonos sound system, and a 55-inch TV to the main boathouse. 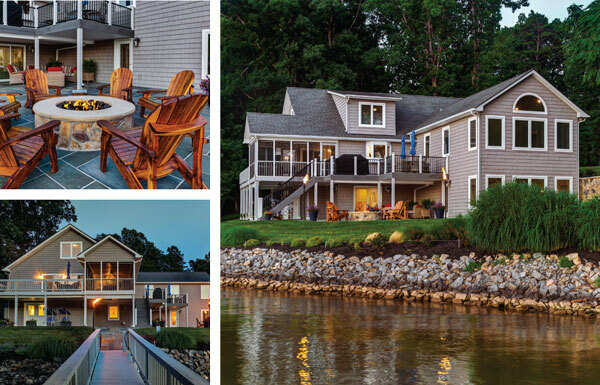 The boathouse area—along with the pier and multiple decks, docks, and patios—brings the feeling of a resort to the Mabry home. With aqua blue Adirondack chairs and tables to hold frosty drinks, all-weather wicker sofas, colorful plants, and views of a lush green backyard, it’s the perfect place to relax and unwind. “We do entertain a lot,” he says, pointing towards the large grill on the patio (he loves to grill filets). “And what we do the most here is on the water,” referencing the multiple floats and the pontoon boat. He adds that he and his family go out on the pontoon boat “every single time” they come to the lake.